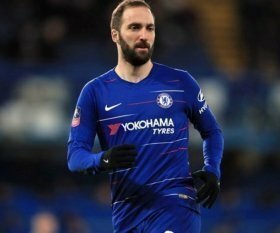 Chelsea boss Maurizio Sarri has said that he would prefer to sign Gonzalo Higuain on a permanent basis in the summer despite the recent transfer embargo sanctioned on the club by FIFA. The former Argentina international has fared decently since his winter loan move from Juventus, and he has amassed three goals across all competitions for the club. In a report covered by BBC Sport, Sarri has revealed that he would like to sign Higuain on a permanent deal in the summer, but that could depend on whether the club can overcome the ongoing transfer ban. "Yes of course, but it depends on the club, it depends on Juventus. It's not clear the situation at the moment. I think that he has to improve physically (and) mentally," he said. Chelsea are scheduled to face West Ham United at Stamford Bridge on Monday night and the match offers them with an opportunity to enhance their prospects of making the top four.